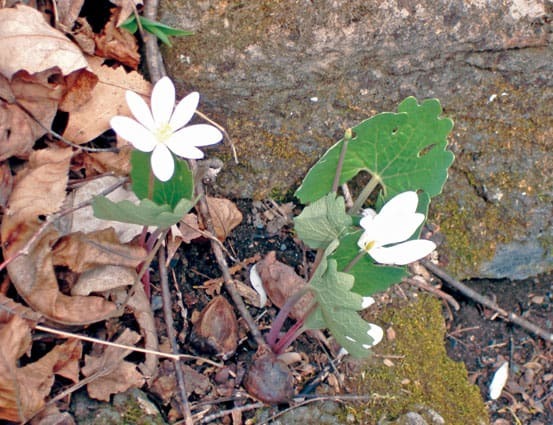 Bloodroot, a spring ephemeral of the northern woods. ORWELL — On Sunday, April 26, Amy Olmsted, horticulturist at Rocky Dale Gardens in Bristol, led a group of about 20 participants on a spring wildflower walk at Mount Independence, a Revolutionary War site at the edge of Lake Champlain in Orwell. The event was co-hosted by the Mount Independence Coalition and the Vermont Division for Historic Preservation, owner of the site. The Mount Independence wildflower walk is an annual event. The group was looking for the “early spring ephemerals”—tiny woodland flowers that are the earliest to appear but quickly vanish until the following spring. The deciduous forests of Vermont—dominated by maple, beech, ash, and birch—are home to these short-lived apparitions. One of these ecosystems exists on Mount Independence, a 300+-acre, mainly dolomite cobble hill that juts 200 feet out of rolling farmlands bordering Lake Champlain, directly across from Fort Ticonderoga. Olmsted explained that the soils on a place like Mount Independence—acidic and poor—are hospitable to the ephemerals. Under a mulch of last year’s leaves, these tiny plants sprout even among tumbled rocks, like a natural rock garden. Along the footpath over the top of the site, he noted the creamy petals of bloodroot; the dainty white, pink or pale blue starbursts of hepatica; the mottled lances of trout lily that precede the stalks; the dangling rows of bell-like shapes on Dutchman’s breeches and squirrel corn (so named because the corms resemble corn kernels)—both relatives of bleeding-heart; and red trillium, a.k.a. “Stinking Benjamin” because of its fetid odor. Most of the blooming was taking place on south-facing slopes warmed by the springtime sun, Olmsted explained. These plants are further protected by features such as fine hairs that gather and hold the sun’s still feeble warmth, or clasping leaves that “incubate” the tender buds. Late spring forest flowers were beginning to emerge as well: foamflower; wild ginger, already sporting its unique, reddish-brown fruit; false lily of the valley, appearing as minute green scrolls, as yet unfurled; yellow violet; strawberry; toothwort; and the invasive garlic mustard. The well-defined cinder paths weave past labels that describe what went on here 239 years ago. Mount Independence is a place where nature and history inextricably coexist. Originally known as Rattlesnake Hill or East Point, the rock was christened Mount Independence when word of the signing of the Declaration of Independence reached the Continental Army brigades stationed here in the summer of 1776. General Washington had ordered that the Declaration be dispatched to the Northern Army encampments and read aloud to the troops. The rock was a natural fortress, with steep, north-facing cliffs and sheltered lake access elsewhere. Because of the narrowness of the lake at that point—only 400 yards—patriot-held Ticonderoga and Mount Independence were key to thwarting the British grand strategy to split the colonies by advancing up the lake to reach the Hudson River. The Mount’s summit was cleared and construction began in the summer of 1776, including barracks, officers’ cabins, fabricators’ shops, a magazine, batteries, parade ground, a hospital, a bakery, breastworks, a masting yard, and a floating barrier bridge across the strait, reinforced by a huge timber boom and massive iron chains—the remains of which are still in the lake bottom. At Fort Ti, and in the fall of 1776, 12,000 troops were stationed at the twin fortresses giving the first British invasion fleet second thoughts. Nine months later, “Gentleman Johnny” Burgoyne launched a massive invasion with an army 7,900 strong. But this time he faced an enemy that was depleted, sick, and underequipped after a harrowing winter, and with the Mount Independence star-shaped fort still unfinished. The British forces easily closed in on both Fort Ti and Mount Independence. One year after its founding, Mount Independence was abandoned in a dramatic midnight retreat. The patriots’ nemesis was Mount Defiance (originally called Sugar-Loaf), an even higher bluff directly across from Mount Independence. Defiance towers 750 feet above the lake—500 feet higher than Independence, and well within cannon range. Until now it had not factored into anyone’s strategy. But on July 4, 1777—ironically enough—the British built, overnight, a battery on Defiant’s summit. The next morning the Americans stared in consternation at British cannons on the hilltop. St. Clair held a hasty war council, and the decision was made to evacuate Mount Independence and Fort Ti. But it had to be done in stealth, by night. The evacuation was to be orderly and smooth. Troops at Fort Ti were to cross the bridge barrier and form a rear guard. But an officer, in a final defiant gesture, recklessly set fire to his cabin, exposing the whole scene to the British looking on from across the lake. The evacuation turned into a rout. Supplies, civilians, and those who couldn’t march were bundled onto small boats, which made for present-day Whitehall. Local farmers and homesteaders also fled before the British advance, making for the fort town of Rutland. Sick and straggling, the Fort Ti contingent made it to Hubbardton with the British in close pursuit, attacking as the patriots were cooking breakfast. Historians have hotly debated St. Clair’s decision, but the firefight that followed on July 6, 1777, is now recognized as an important rear guard action that bought precious time for St. Clair’s army to reach Castleton and regroup. The British later returned to Mount Independence, driving off an American attempt to retake it, and what the British couldn’t burn they dumped in the lake. Soon after the Revolution, tourists began arriving to view the remains, and the site’s iron relics were gathered up for private iron production. Mount Independence remained in private hands for almost two hundred years; cows grazed among the foundation stones late into the twentieth century. In 1961, the State of Vermont began acquiring parcels in the southern portion of the knoll, conducted archaeological work, and in 1966 laid out the footpaths that meander through the site. The northern part of the knoll is protected under ownership of the Fort Ticonderoga Association. Mount Independence is both a state historic site and a National Historic Landmark. Paths through the encampment area are wheelchair-accessible. The site includes a modern museum that tells the story in detail and includes many artifacts related to the site and the men who served here. The site opens Saturday, May 23. For more information visit www.HistoricVermont.org/sites. The Coalition is a nonprofit “friends” group of about 110 members that began in 1989 with the mission of supporting “interpretation, development and research” on and at Mount Independence. For more information visit, mountindependence.org.